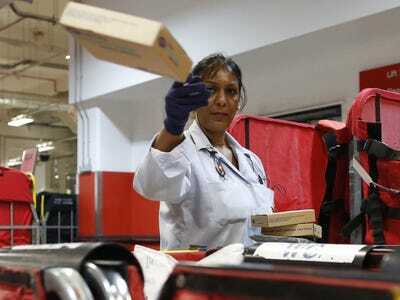 REUTERS/Olivia HarrisPostal worker Jess Kaur, who has worked at the Post Office for 13 years, sorts parcels at Mount Pleasant sorting office in London July 26, 2013. Britain’s Royal Mail is blaming online retail giant Amazon for a fall in first-half profits, The Times reports. In its financial report released today, Royal Mail saw its pre-tax profit drop £15 million to £218 million in the six months to Sept. 28. They were £233 in the same six-month period last year. Even though UK parcel volumes grew by 2%, revenues in this department fell by 1%. Overall revenue grew by 2%. In a statement, Royal Mail accused Amazon’s own delivery system of “a reduction in the rate of growth of the addressable UK parcels market,” and forecasted further cuts in its growth in the future. “We estimate that the impact of Amazon delivering an increasing number of its own parcels using its own delivery network will reduce the annual rate of growth in our addressable market to 1-2 per cent,” Royal Mail CEO Moya Greene said. Other divisions of the national service are also under threat. The BBC reports that everyday letters delivery business fell by 3% in the past six months, a figure that was less steep than expected thanks to the Scottish referendum, which boosted the delivery of political pamphlets and poll cards. Amazon started its own delivery system in April this year, and has recently announced it is going to test drones for shipping the post. Amazon declined our requests for comment.